Travel with a butterfly and see the world. Milan, the fashion capital of Italy, rightfully deserves its name. With multiple shopping streets such as Via Montenapoleone and Corso Venezia rivalling that of Paris’ Champs Elysses, it’s no wonder everyone dresses so elegantly and differently in Milan, despite being in a country notable for being impeccably fashionable. But fashion isn’t the only thing that makes the city stylish; it’s the entirety of its environment. The architectural design, its presentation of food, and even Milanese mannerisms are all very classy. 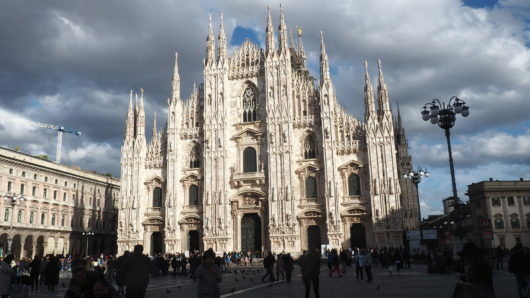 Yes, Milan is a stark contrast from Naples, a city that is just one hour away by plane. I love Milan. This trip, I definitely put Milan and Capri Island as two of my favorite cities, no doubt. Despite how people tell me how dismayed they are about how “old” Milan is, I don’t really agree. Sure, it’s not Barcelona, but Milan has its own charm and beauty. It sort of reminds me of New York, but without the hectic, hustle and bustle, and much cleaner.